Editorial: Standard of Miss Hong Kong Dropping? One of the most talked about events of the year is the Miss Hong Kong pageant. The show is one of the most important events of the year and a great inspiration to many young women. However, over the past years, many people think that the standard of Miss Hong Kong is slipping and these women are not as pretty as previous Miss Hong Kong winners. But are standards truly slipping? Do the winners still possess beauty and intelligence? There are many well known Miss Hong Kong winners who have pursued successful careers since being crowned. One of the most famous and deemed the most beautiful Miss Hong Kong is Michelle Reis. Many people perceive her as the ideal Miss Hong Kong and a “Dai Mei Yan” (a beauty). As a result, it seems like we are trying to find the next Michelle Reis in the subsequent Miss Hong Kong pageants but realistically, how many beautiful peopleare there in this world? Perhaps it is because one of the most beautiful people on television is crowned that makes us feel that standards are slipping. The 2010 Miss Hong Kong winner is Toby Chan. Her victory brought many criticisms and outbursts, similar to the reception her predecessors received in the past few years. However, I think that the women are not at their prettiest when they are first crowned. It takes time for them to find a suitable style and image, allowing their beauty to shine through. I have noticed this recently whilst watching the latest Miss Hong Kong show. TVB brought back several Miss Hong Kong winners from the past and they definitely outshined the contestants; Tracy Ip, Selena Li and Mandy Cho looked especially stunning and like true Miss Hong Kong winners. This could be the fact that they were no longer contestants so they could smile much more naturally. Another reason is that these women were able to dress in a way that matched their personality and when they are able to express themselves, they are much prettier. On the other hand, the contestants are usually dressed alike and the hairstyles sometimes do them great disfavour. As a result, a woman does not truly become a Miss Hong Kong overnight. The contestants undergo a rushed training session within a few months prior to the actual evening of the competition. Before 2004, the Miss Hong Kong pageant was split into two shows, which allowed the contestants more preparation time. Apart from beauty, intelligence is also contributing factor. Many winners in the past were crowned as the winner because they performed really well during the question and answer section. Aside from responding well in the interview segment, the winner might have been a favourite from the start. Toby Chan gave very good answers this year and her performance was very steady. She had bagged two other awards previously so winning the title was not really a surprise. 21 comments to Editorial: Standard of Miss Hong Kong Dropping? I think it’s very true that the winners become a lot more beautiful after their win. They need to find their sense of style that suits them. Most of them usually look a lot better after their crowning night. Like Winnie Yeung and Tracy Yip, their looks were horrible (I think it was their hair or something) on their crowning nights. Lee San San was one of the few that I felt looked better during the pageant night. I don’t think she was as pretty afterwards. In terms of the standards, I think that it’s hard to say. There were many beautiful winners back in the late 80’s and 90’s, but there were also some plain looking ones too. I think the standards have gone down during recent years because there are too many paths for girls to enter the entertainment field now compared to the past. In the past, actors and actresses, the most established ones that we see today, all went through the acting class training. Now, you can become a model (be a lang-mo), do commercials, have connections, enter pageants, singing contests, etc and get in the entertainment industry. And from what I see, a lot of pretty girls went the modeling route immediately. It’s so easy to become one nowadays as long as you have the body, face, and willing to show some skin. They don’t have to go the pageant route. And I think it’s not just MHK, but the industry in general that the talent is not where it used to be. All singers, actors, etc had their own distinct voice and character in the past. When a song was played on the radio, you knew who the singer was. Now there is just too much that no one stands out. I also think that times have changed and with the evolution of the internet, technology and growing media vehicles, people’s comments and opinions are easily shared and transparent now compared to before, so the audience can easily offer feedback and criticisms. In any year, there will always be people that like the winner and dislike the winner.Everyone will have their own favorites, because beauty is in the eye of the beholder. They need to bring back semi-finals for god shakes just get more interest in the ladies. This year was really low expectations. I dont know what is wrong with the selection process but they are unattractive. Raymond Wong-Kevin Cheng-Miss HK past winners was below standard. It was not really great year at all for TVB. TVB is going downhill like always… I don’t understand why they have to put a picture of Michele Reis in this article?? Don’t tell me, that you have to look or be like her in order to meet the Ms. HK standards?? I personally think other Ms. Hks were better than her…. We are launching a variety of new original feature articles, such as Celebrity “Twins” and “Editorials” to expand coverage of entertainment topics. Hope everyone enjoyed this article! Jayne, THanks for telling me. I thought that it was a translation of a Chinese article. I am so confused. What is this celebrity twins and editorial feature? I don’t quite understand what it is. Is it just what some members think of a certain topic?? You can find many better looking girls than them in Mongkok or Tsim Tsa Tsui. Yes, I agree with the editorial. I believe Miss HK contestants look better with time. Factors could include what was explained in the article. But I also think a number of the girls would have had some sort of cosmetic enhancement done after entering the pageant which would ultimately make them look better. I don’t think anyone would admit to it though. HeTieShou, yes that’s correct. These are original features written exclusively for JayneStars. If there is no referenced source, then it is not a direct translated news item. HeTieShou, many American gossip magazines such as People, Us Weekly etc. have features such as Celebrity Twins, where artists who look alike are compared. Our Contributing Writers have done a great job with coming up with original content. The TVB reviews are also written exclusively for this site. My vision for JayneStars is to make it more into an entertainment magazine with a variety of fun features, in addition to the regular news updates. Am I the only odd one who find this year Ms HK quite cute and pretty? She looks like Vivien Chow who I always thought look like an angel. I wanted to give this editorial its due credit. I am among the people who believed that the Miss HK competition standard has fallen. Although, I am more of the opinion that it has been falling for the past five years rather than going back to Tracy Ip, Mandy Cho, and Selena Li who were contestants 2005 and back. I accept the editor’s belief that many of the girls can get better looking after the competition because they are allowed to dress themselves. I accept that the prettiest may not always win because the competition judges by more than looks. Yet, I still feel they are choosing the wrong girls as many people might share this belief. I question the relevancy of the Miss HK competition. I think times are changing faster than the competition. I think the competition is headed in the wrong direction. I was looking at the demographics of contestants a few years back and found many of them were Chinese from outside of HK. The ages of many that I have seen are more concentrated in 21-25 than the 18-21 especially the winners. The two factors lead me to believe HK has no good looking girls or ones willing to compete. Maybe, its because that few of the Miss HKs ever really amount to something that discourages the young and native HK girls from competing. TVB control of the media does really limit opportunities to the people they choose. The editorial may be right and that there isn’t enough time for the girls to show themselves. The choices of the girls seem arbitrary to the audience because we aren’t seeing the criteria the judges judge by and personally I question the judges themselves. The event feels more and more like a show just so the upper class socialites can pick their own winners and favorites. I do agree that the overall quality has dropped but I do think that it takes time for people to recognize the beauty within an individual. For example…when Shirley Yeung won in 2001…I heard a lot of “How can she be a MHK winner?” or “If she won…anyone can win!’ But when I see her know…I think my perspective has changed and I do think that she is one of the better winners within the last ten years. But then again…there were years that were really disappointing. For example, in 2002, in my opinion there were contestants who had the whole package but were not placed. I couldnt understand how they lost to the 3 that were eventually placed. I remember reading that the eventual winner last year was not one of Simon Yam’s pick (one of the judges). This also makes me wonder…why do they even bother to have judges? I think that TVB should bring back the semi-finals…just so that viewers will get to see how the contestants really are. Most of what we know about the contestants comes from the media…and I think its really not fair to them. I think they are all pretty women. Mondy Cho was not my favourite (was rooting for Selena), but, I remember at that time that I was ok with her win. Rabee’s Yeung didn’t make much of an impression to me, but, when I see her now, I think she’s beautiful. Priscilla Chi was the only one whose win I disagree with. But, her win was not surprising because, for some reason, she stood out and made an impression during the competition. I don’t even remember Rabee’a at all after the competition. When I watch ‘Your Class or Mine’, I don’t remember Rabee’a was a Miss HK. But, I remember Priscilla Chi and remember that she chose singing as as her talent performance. Mandy Cho might not be Simon Yam’s pick, but, maybe, her overall marks gave her the title. Simon Yam was only one of the judges. We don’t know what the other judges thought. Haha, I’m also one of the people who were strongly against Shirley’s winning. 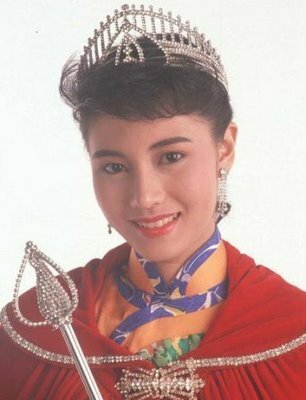 But her win was also no surprising because she was the most popular contestants and the most pretty (and she looks like Charmaine Sheh at the time). I was against her winning because I found that she look like a school girl (very kiddy looking) and she answered badly in her Q&A section (no poise or intelligence). I was rooting for Heidi Chu all along. I now like Shirley as a personality. Her acting still have a lot of room for improvement, but, I like her down to earth personality. But, until now, I still think Heidi Chu (second runner-up) was more deserving than her. Haha, I guess Shirley is one of a kind Miss HK. A Miss HK that looks like a school girl (instead of the elegant type). If you look back at all the past Miss HK, none is like her. Kidd, I think K2 meant to say that last year’s winner, Sandy Lau, was not Simon Yam’s pick, not Mandy Cho back in 2003. I am pretty sure he was a judge at last year’s pageant but not back in 2003. i remember he liked the 1st runner up, Germaine Lee and I think she got her eventual placement because he gave her very high scores even if she was unnoticed and a blackhorse during before the night of the pageant. As for 2003, I agree with you. I think that the winners were all decent, and I think that the winners were all decent, although I was quite surprised that Selena did not even make top 5 with all the side awards she won. I originally thought the winners would be 1) Mandy Cho 2) Carrie Lee and 3) Rabe’a Yeung. I thought Rabe’a had a second runner-up look and I really liked Carrie Lee’s performance. She seemed quite eloquent and had the total package, so I was disappointed when she didn’t place. I think I was also satisfied with the results overall in ’05 and ’06, but was disappointed with the results in these most recent years. This time, I remember all 4 winners. 😀 Cerina was the crowd favourite. I was suprised she was not placed too and surprised at Tiffany’s win and disagreed with the result. But, after the contest, I grew to like Tiffany and felt that she did deserve her win. Too bad she prefered to leave the entertainment industry. Based on her performance in ‘Not Just A Pretty Face’, she has acting talent. That was her first series I believe and her acting was natural. Vitoria was tall and beautiful. Meet the MHK requirement. Cathy Wu obviously won for her wit. She did very well in the [email protected] section and was very witty and funny. I personally also think she has the best body. Many contestants were slim but they also have thick waist. But, Cathy Wu has a clear hourglass figure with small waist. I agree with Colly that overall the standard of MHK has not really dropped. But, people tend to compare the current winners with the cream of the past winners. Of course, they will fall short. Can check out the all the winners here. There were pretty and no so pretty winners in every decade. Yup…I was definately referring to 2002 and not 2003. I was actually pretty satisfied with 2003 winners. In 2002…I thought that Cerina should at least place 3rd. She did really well overall…and she was very pretty. Another contestant I thought deserved to be placed was #2 Yvonne Yeung. I thought she did really well in the question/answer segment. I mean her answer wasn’t as witty and funny as Cathy…but I thougth it made her sound really educated and intelligent. My pick for the winner that year (after watching the finals)…was #7 Gisela Yu. I thought she had the whole overall package. I do agree that Shirley Yeung is a bit different from other MHK winners. I think of her as an actress more than a MHK winner. Her acting definately has room for improvement. But I think my perception of her changed after learning a little more of her personality. I find it rude for magazines to label her as “cheap” or “frugal”. I remember reading a magazine once and they made it sound soooo negative that she was purchasing products from regular stores instead of boutiques. They even emphasized that she drove a car that wasn’t as expensive and saved gas. What’s wrong with trying to save money?? I mean just because you are a celebrity…it doesn’t mean that you have to use only brand named products. So I do admire Shirley for not caring about what reporters and continue to do what she thinks is right. Mandy cho is really pretty n cute at the same time just don’t know why her husband looks so retarded. I think that the entertainment industry should just start finding girls in the streets. There’s a lot of pretty girls that just don’t care about these pageants and left MHK with few choices to choose from except ones that enters the pageants. This years winner is cute but she’s got horse teeth. She’s just not as pretty compared to earlier ones. Why does every girl got to have an oval face to be pretty??? What about girls with round or square faces??? Are they ugly then??? ?